What do you do if it’s 1941, your country has just entered a war, and there’s an urgent need for an engine to propel a tank – an engine you don’t have? If you are the Chrysler Corporation, you develop a design that uses five of your six cylinder car engines, arranged around a common crankcase. The result was 30 cylinders, 21 litres and an output of 470hp at just 2700 rpm! If Chrysler had started from scratch to design a tank engine, they would have developed an engine that was nothing like the A57 Multi-Bank. But the need for speed – both in design and production – made use of existing tooling and design obligatory. The starting point was the L-head, 4.12-litre in-line six. A slightly revised cylinder head reduced the compression ratio to 6.2:1 from the standard engine’s 6.8:1, but production Dodge carburettors were retained. 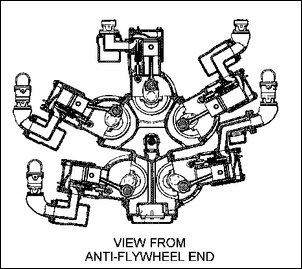 The five engines were arranged around a cast iron crankcase, with each ‘sub engine’ being geared to a common ring gear. A single central shaft handled all the output. 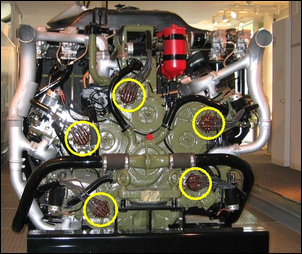 Using existing tooling and designs were the cylinder blocks, pistons, connecting rods, crankshafts and cylinder heads. Another advantage of the design was its compact shape; important in the rear-engine tank installation. 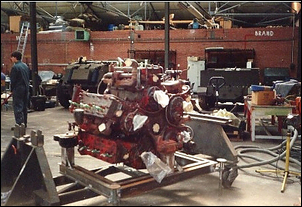 The prototype engine had major difficulties with carburetion; the differing lengths of the intake tracts made carburettor synchronisation and fuel distribution problematic. The carbs were moved so that they all sat at the same level (also improving accessibility) and sheet metal guides were inserted in induction pipes to improve fuel distribution. 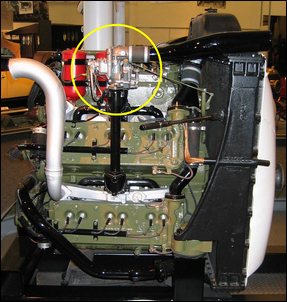 The placing of the carburettors on the same plane also simplified the throttle linkages and air cleaner. The distributors, that on the original engines were positioned alongside the mid-point of the engines, were moved to the end of the camshafts. 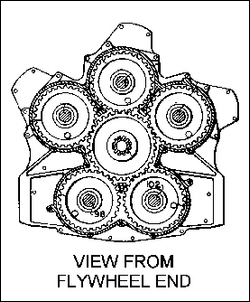 The camshaft of each sub-engine was driven by gears instead of the chain used on the donor car engine. 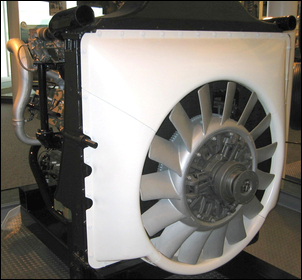 The prototype engines used five separate water pumps belt-driven from the crankshaft pulleys, but because of the lack of individual flywheels, the belts were subjected to alternating loads and belt life proved short. Given that a tank engine must be extremely reliable, the decision was made to use a single water pump driven by an accessory shaft located in the central crankcase. Dry sump lubrication was used with an oil cooler. Complete with radiator, cooling fan and clutch, the Multi-Bank weighed a considerable 5244 lb (2384kg). The engine was used in the M3A4 and M4A4 Sherman tanks. What an amazing piece of engineering!